What can community bank CEOs learn from a hoodie-wearing football coach about managing risk? Plenty if that person is Bill Belichick, coach of the New England Patriots (by far the most successful NFL coach of the past 15Ys). During his tenure, Belichick has been to 7 Super Bowls - 2 with the NY Giants and 5 with the NE Patriots and has earned a champion's ring 5 times. This past weekend, the Patriots secured another trip to the Super Bowl, so the legacy continues. In succeeding on the gridiron, Belichick has unlocked the Holy Grail for football coaches and bank presidents everywhere, removing risk from a highly risk-laden activity. For bank executives, risk management is a primary topic of discussion. Discussion occurs in board and management meetings, at the water cooler or even while watching Monday Night Football. Most community bankers have even rolled out enterprise risk management (ERM) strategies, but sometimes it seems like banks fail on basic blocking and tackling. Certainly, bankers aren't retreating on ERM initiatives. If anything, they're more determined than ever to get it right, because failure isn't a reasonable option. According to the 2013 Community Banking Industry Outlook Survey by KPMG, ERM is viewed as the second most significant barrier to growth. A full 27% of respondents said so vs. 22% in 2012, so its importance is also increasing. Keep it real and keep it positive - Bankers have been managing risk since the dawn of time, but what is changing is the nature of the risks banks manage and the speed of change due to factors like technology, regulations, customer and market conditions. Focus on areas of greatest concern with these elements in mind. Start small and aim for steady growth - Experiment with pilot programs and small steps to see what works best and then do more of the same. Speak with one voice - Senior management should always lead from the top down, but it's also best to appoint one leader, like a chief credit or risk officer to be that one voice. Community banks do a great deal of collective decision making, but with ERM it's best to present a consistent message. 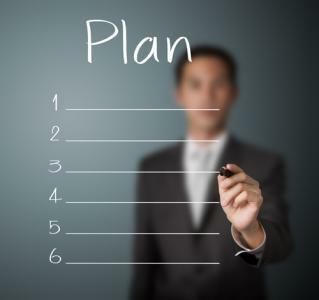 Build a 3Y plan - Begin with a strong business plan for the coming 3Ys and apply the bank's risk measurements to that plan. Then the bank's ERM follows the same path as the overall road map for the bank. Measure key indicators - The best community bank ERM programs have a dynamic model and framework that doesn't focus only on risk assessment. Risk assessments are a part of ERM but not the whole and they work best when they are linked to key performance indicators. Perhaps the main goal of any initiative is to identify key risk areas early in the game. Identify areas of sensitivity and test them again and again, using varying assumptions and multiple scenarios. Above all, don't take ERM for granted. In an era of tighter credit, tougher competition and strict regulation, a good, enterprise-wise ERM strategy isn't a luxury. Like football, your bank's ERM plan needs to adapt with the times in order to keep on winning. With the household consumer confidence index jumping to an 11y high, Treasury yields skyrocketed 13bps by the close. As we being the week, yields are unchanged as there are no major releases scheduled. (1 YTD): Regulators closed: First National Bank of Crestview ($80mm, FL) and sold it to First NBC Bank ($3.6B, LA) under a P&A agreement. First NBC gets 3 branches, all of the deposits and 78% of the assets. 1) First Sound Bank ($97mm, WA) will acquire Eastside Commercial Bank ($37mm, WA) for an undisclosed sum. 2) Associated Bank ($26B, WI) will acquire risk and benefits consulting company Ahmann & Martin Co. (MN) for about $48mm. The acquisition expands Associated's insurance offerings related to employee benefits, risk management and business insurance. 3) Optum Bank, Inc. ($3.3B, UT) will acquire the health savings business of Huntington National Bank ($64B, OH) for a 5.3% deposit premium. 4) Washington Savings Bank ($264mm, IL) will acquire First Federal Savings and Loan Association of Mattoon ($88mm, IL) for an undisclosed sum. 5) Terminated deal: Sunflower Bank ($1.7B, KS) and First Western Trust Bank ($688mm, CO) announced they have mutually agreed to terminate their merger agreement announced in Sep 2014. Citibank announced it plans to close 60 CA branches this year as it continues to modify its network to focus on larger urban city centers. The move last week by the Swiss National Bank to break away from its peg on the Euro has wiped out multiple currency brokers around the world. Google said it will leverage online lending platform Lending Club to finance eligible business partners seeking to borrow as much as $600k. Loans are structured as 2Y deals with payments based upon borrower cash flow. The BBC reports Google has said it will cease producing its Glass product in the next few months. The OCC released its 96 page conflicts of interest handbook focused on asset managers last week, but there are many items within it that are applicable to community banks. At the highest level, it reminds bankers that their bank must deal with customers fairly and require ethical behavior from bank officers, directors and employees.